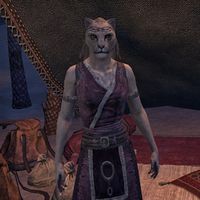 Hashuri-daro is a Khajiit pack merchant who runs the Hashuri's Pouches & Pockets stall at the Baandari Caravan marketplace in Kozanset. When spoken to, she gets straight to the point, "I am thinking you need more bags. Easier to hide things, yes?" This page was last modified on 7 January 2018, at 19:54.